Optical Mice and Laser Mice are quickly replacing the traditional Mechanical Ball mouse because they are more sensitive, mouse pointer works on uneven surfaces without the mouse pad and there's no internal cleaning required since there are no rollers or rotating wheels. The only issue associated with LED based Optical Mice is that they tend to get sticky over time because surface dust collects on the soft pads located near the light emitter. 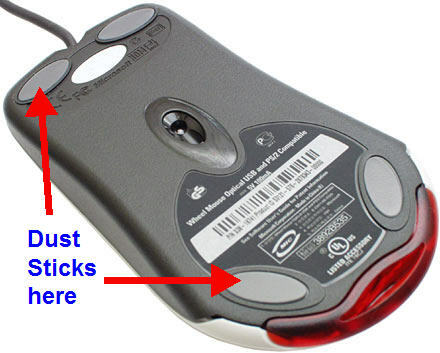 This can result in erratic cursor movement like it suddenly jumps to a different location on the computer screen or move very slowly or even worse, the mouse may not work at all. I know it can get very frustrating when the mouse movement is not smooth but there's nothing to worry about. If you notice any of the above symptoms, all you need to do is clean the bottom of the mouse without opening the mouse body. The easiest way to remove dust sticking on the mouse soft pads is by using your finger nail. Invert the mouse and gently rub your finger nail on each of the soft pad. This is not a very hygienic approach but definitely the fastest way to get going. Never use a sharp instrument like Shaving Blade, Knife or a Toothpick to clean the mouse as that may do a permanent damage to the soft pads. Alternatively, if you want to keep your hands clean, get a soft cloth dipped in water and gently rub it over the soft pads. Once the pads become slightly wet (not soaked), pick a clean white sheet of paper and run the mouse over it. The paper will absorb any of the remaining dust or stickly grease. There are chances that some grease is also sticking to your mouse pad. Apply some mild-soap water to the surface and wipe it with the cloth.